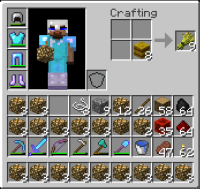 Have 8 bales of hay in an otherwise full inventory (say, 35 stacks of cobblestone). Using either the inventory crafting screen or a crafting table, place the 8 bales of hay into the crafting area, and then shift-click the wheat to convert it all and place it into the one space left in inventory which had the hay bales in it. Only 64 wheat will be placed in inventory even though 72 should have been converted. 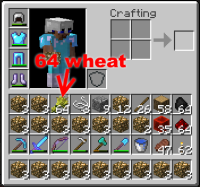 Understanding that a space in inventory can only hold 64 wheat in a stack, perhaps the other 8 should have been left on the crafting table or dropped on the ground instead of lost.